We are continuing with our Monday Book Serialization, Edward S. Ellis's 1868 Dime Novel, 'The Steam Man of the Prairies.' 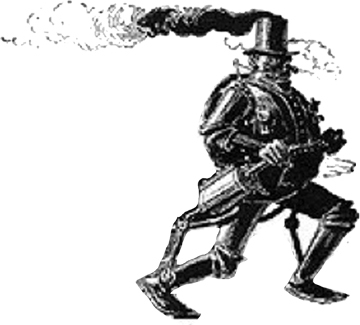 Today the Steam man really gets an opportunity to Go Go Go! In Chapter Seven, 'The Steam Man on His Travels,' Baldy and Brainerd pack the Steam Man up like a piano, and put him together out on the Prairie, where they let him strut his stuff!